Will this be an all-day event? Are the bachelor party goers active and adventurous? Are you planning to go to any bars or clubs? Check out our tips for planning a great bachelor party! If you answered yes to any of those questions you may want to consider throwing your bachelor party at Splatball. Splatball is conveniently located in downtown Minneapolis, putting your group close to the late-night action. Spend the day playing paintball with the guys, and then hit up the bars and clubs nearby after! 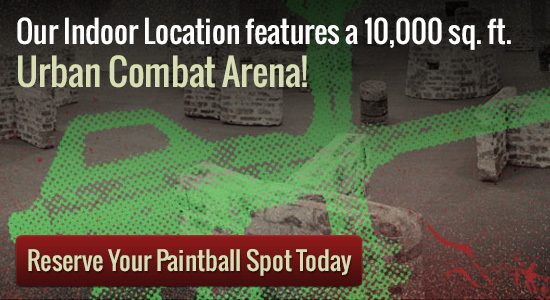 Splatball is an indoor paintball field that has been in business since 1984. It boasts a 10,000 square foot indoor urban combat arena as well as a retail store. The indoor field is climate controlled, so even if it is raining or snowing outside, you are going to be comfortable. Do you have group members who would rather watch the action then participate? No worries! Splatball even has an observation room as well as a party room. If you are interested in hosting your bachelor party at Splatball make sure to call in advance. Sessions are available daily and reservations are welcome. Reserve your bachelor party online or join one of our walk-on sessions. Make sure to ask about out free rental upgrades for your bachelor party. Call 612-378-0385 to book your game today! More information on reservations here.